The son of a zero-handicap father and brother to a very good player and great athlete (Ron Stull – also a life member of the PGA), it was easy for Steve Stull to be inspired by the sport. He won the 1982 Washington Open and has a very strong playing record as a senior PGA Professional. “I have been amazed at my play and am realizing God is giving me a few more good things late in life – I can’t explain it any other way,” said Stull. 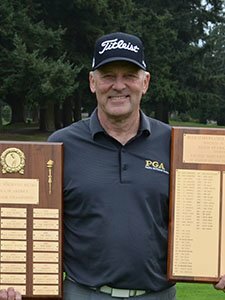 He recently won the PNW Senior PGA Championship in a six-hole playoff against Tom Sovay.